The chief executive of chief executives has come to dominate an era in real estate when government largesse means the difference between deals and no deals. TARP, TALF, PPIP, OMFG!-the feds' breathlessly watched efforts to loosen credit markets and therefore get capital moving here and around the globe places this Chicagoan securely (he h) atop our list as the most powerful person in New York real estate. Stephen Ross (3), Chairman and CEO of the Related Companies. Owner of the Time Warner Center and now the designated developer of the 26·acre West Side rail yards, Mr. Ross is the city's unparalleled king of private development. Chairman of the Real Estate Board of New York and a builder who timed his developments quite well with the market, Mr. Ross is the one whom landlords looking to sell are quick to call up, should he still have an appetite to buy. Mort Zuckerman (lA), and Ed Linde, Chairman and CEO of Boston Properties. The busiest commercial real estate buyer in the U.S. right now, Messrs. Zuckerman (pictured) and Linde's Boston Properties also claims a sizable chunk of office Manhattan. This includes, of course, the GM Building, bought with minority partners in a record $2.9 billion deal closed just before the recession. Those were the days! Michael Bloomberg, Mayor of New York City. While New York's real estate sector depends on the broader economy far more than anything else, Mr. Bloomberg is perhaps the best-positioned person in government to nudge it one way or another. Using his tools of taxes, incentives and disbursement of infrastructure investments, he has broad powers to shape the future of individual developments and city wide trends. They've had a rough go of it over the record-smashing Stuyvesant Town/Cooper Village acquisition, but "Speyer" remains arguably the marquee surname in New York commercial real estate, with 15 million top-shelf square feet in Midtown alone, including Rockefeller Center and the land lease on the Chrysler Building. 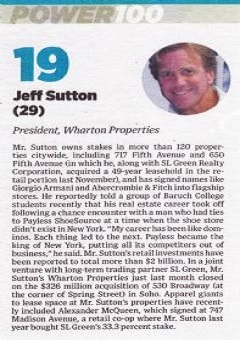 Jeff Sutton, Founder and President of Wharton Acquisitions Corp.
Mr. Sutton has collected more than 100 city properties, by himself or with partners like SL Green, and he shows a particular penchant for repositioning them through retail. A few cases in point: 609 Fifth with American Girl; 40 West 34th with American Eagle; and 720 Fifth with Abercrombie & Fitch.